Many lightweight trampers scorn camp footwear as unnecessary weight. Personally I love getting into camp and slipping off my tramping shoes to let my feet breath. 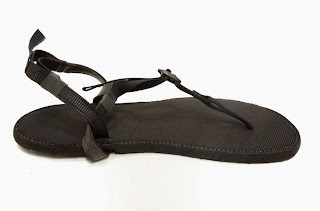 I have experimented with a number of sandals and thongs (even a fleeting moment with Crocs). My current choice is the Bedrock Gabbro Lite at just 116gm. In colder conditions, or for sandfly protection, I team these up with toe socks - not the 5 toe variety, but the Japanese style with two pockets (big toe and rest of toes, sort of like a mitten). I found the basic toe sock was difficult to put on when my feet are damp (like after bathing). I have become a fan of the Luna's, a similar sandal to the Bedrock and for camp shoes they are perfect. Less so is the 5 toe socks. Where did you get your Japanese (Tabi I think) socks? Nielsen - Re socks, my Japanese tramping buddy from ATC got these for me when he was recently back in Japan. I dare say you could Google and buy on web? Thanks, yeah thought of Google, but with size UK 12+ sizing seems to be a problem, but will keep searching. You done the TGO? We have been accepted for 2015. Congratulations on the TGO, no never done it as a teacher cannot get enough time away. Doing sections of Coast to Coast Sweden instead. I am simply amazed with that sandals which weighs only 116 gm. These kind of sandals are just appropriate for proper hiking or camping. I soon plan to buy them. However, I will also like to share that one of my friends suggested me rangehiking.com which provides us with complete hiking gear checklist assuring our hiking expedition to be trouble free and safe. Coincidence James - just this morning I read in our local newspaper that an overseas hiker has just "run" our Te Araroa trail (length on NZ - 3000Kms) in these sandals accompanied by the owner of the company!